Hello all! 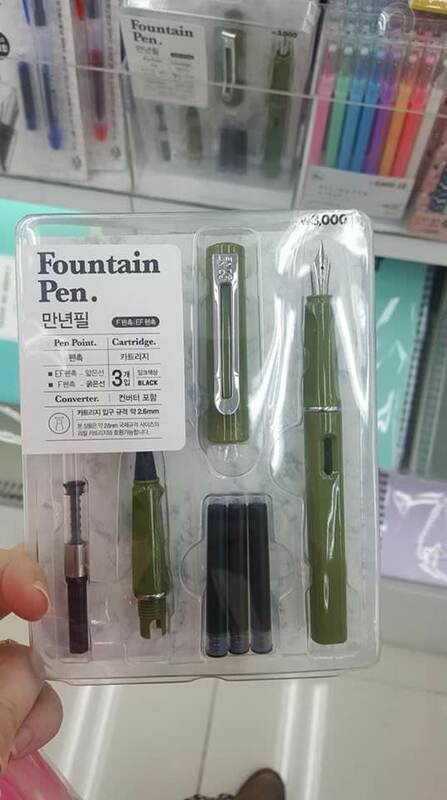 So I ran across this pen at Daiso in Korea for 3,000 won. (about $2.50) It looked interesting, and came with cartridges, two nibs (f open & ef covered) and a converter. It looked pretty interesting, like a Lamy Safari knockoff, so I picked it up. 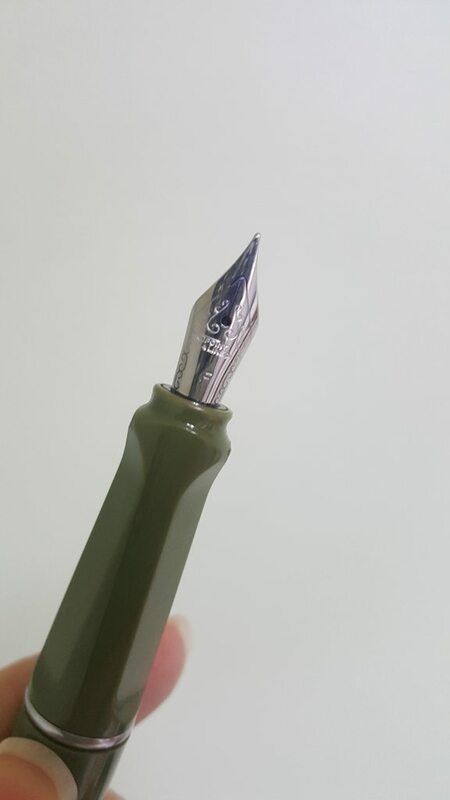 The nib seems really nice, but I can't for the life of me figure out what brand it is. The only markings are imprints that say "point&line" on the clip and the nib. 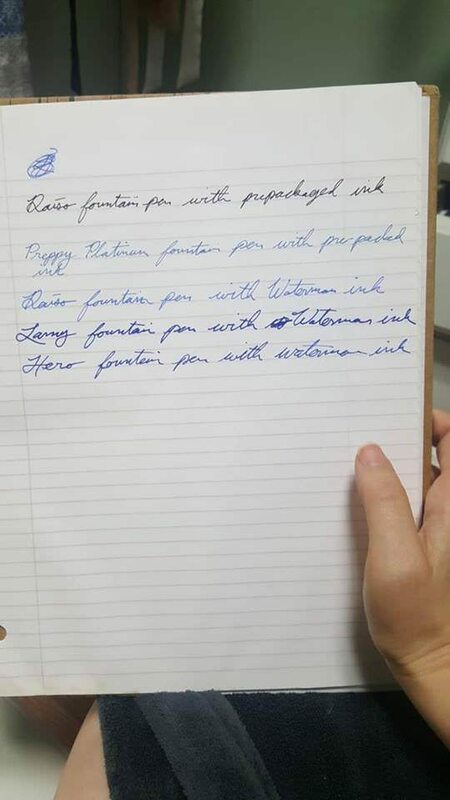 I've never heard of a fountain pen brand with that name. I'm not an expert, though, just a casual user. 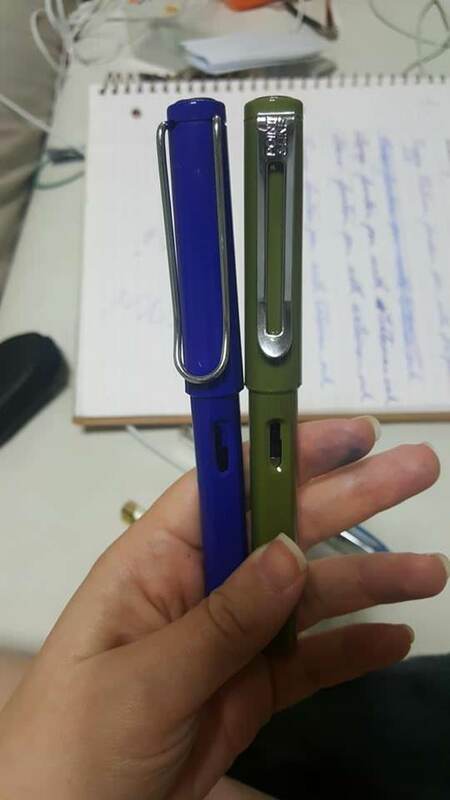 Direct comparison with Lamy Safari. The Safari lid is a lot heavier, and the body of the Daiso pen feels cheaper even though it's the same weight with the cap off. But that's expected, considering. Not pictured, but the converter is almost exactly the same as the Lamy converter. Lines 1 & 3 are the Daiso pen F nib with the native ink cartrige (which I hated) and then with Waterman ink. This nib is crazy smooth -- smoother than my Lamy or my Preppy. And with a decent ink, it laid down a nice fine line. I really like the pen, considering the price, but I'm really curious as to who made it. Anyone have any ideas? Edited by Lhyrre, 10 October 2018 - 05:45. No idea, but looks like a great find! Good colour too! Sorry, I cant help with the maker either, but its nice to see some inky fingers with the pen have fun with it! Edited by Mech-for-i, 10 October 2018 - 06:15. Well, that's the quality knowledge I expect from you guys! I figured it was Chinese, considering that almost everything in Daiso is made in China. Daiso Japan has sourced from Jinhao before, I think. It's not concrete, since Daiso Japan and Daiso Korea usually carry different products, but it's probably Jinhao then? Hero makes a Safari clone. If like Levies jeans, made with slave labor. I toured the Lamy factory some 5 years ago.....no slave labor.........the normal German 6 weeks of paid vacation, no sick hours to hoard.....skilled workers being paid a good living wage. High tec mass production. Good quality for the price. It's absolutely a Jinhao. The 599 has a unique clip compared to all the other Lamy copies. Can You Id This Pen With These Mediocre Pics Only?